Swede-O Thermoskin Carpal Tunnel Wrist Brace with Dorsal Stay from HealthyKin.com protects the wrist from movements that can lead to Carpal Tunnel Syndrome. Increases circulation to aid in the treatment of RSI and tendonitis. Position the product so that the metal splint is on the inside of the wrist. The hand section of the splint should be placed in the mid- lower part of the palm. 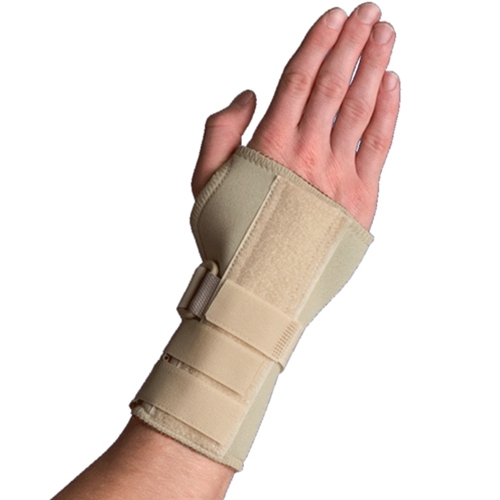 The straight dorsal splint runs on the outside of the wrist down the lower forearm. Wrap the velcro straps around the forearm and secure, then wrap the locking strap around the splint and secure.